Hi there! Are you looking for a fun way to spice up your love life that won’t break the bank? Or maybe you’re searching for a fun DIY gift? Do you ever play the “Well, whatcha wanna do?” game on date night? Do you love scratch off cards – or maybe know someone who does? 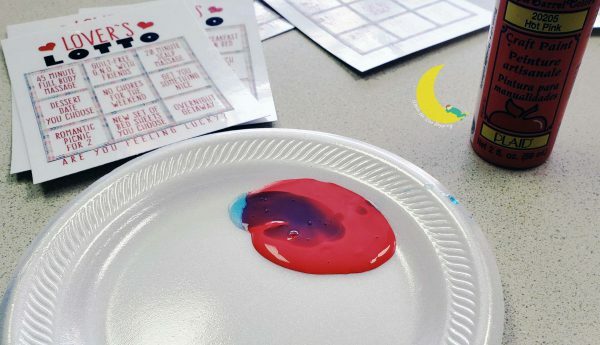 Then these DIY scratch off cards are just what you are looking for! 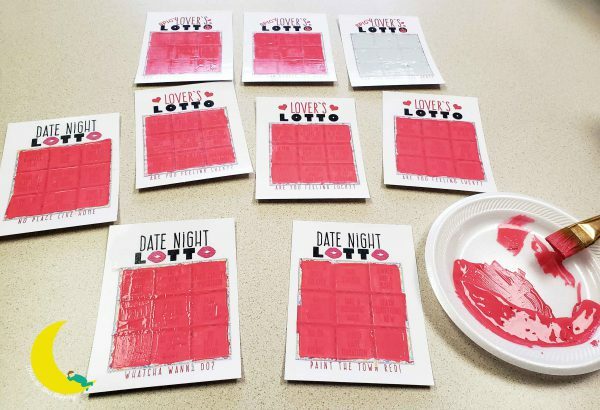 In just 8 super easy steps and an afternoon, you’ll create a one-of-a-kind set of DIY scratch off cards that will add a little fun and mystery to date night. They are perfect for romantic gifts or just for a little change of pace. The best part about these DIY scratch off cards are that you can customize them to fit your needs. 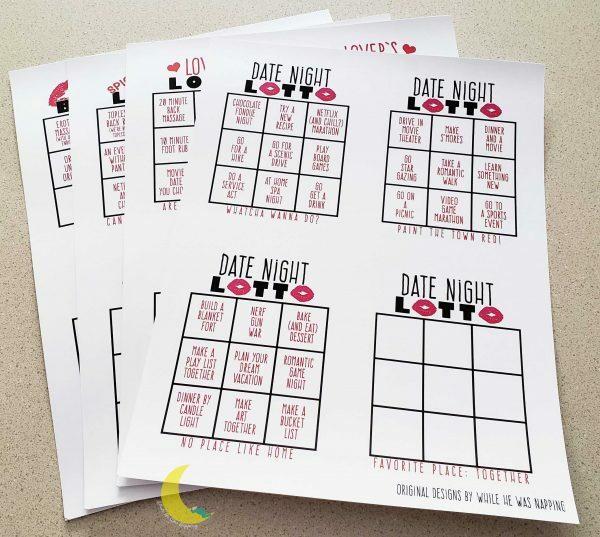 If date night has become predictable and lost it’s excitement, then something like a Date Night Lotto card would liven things up! 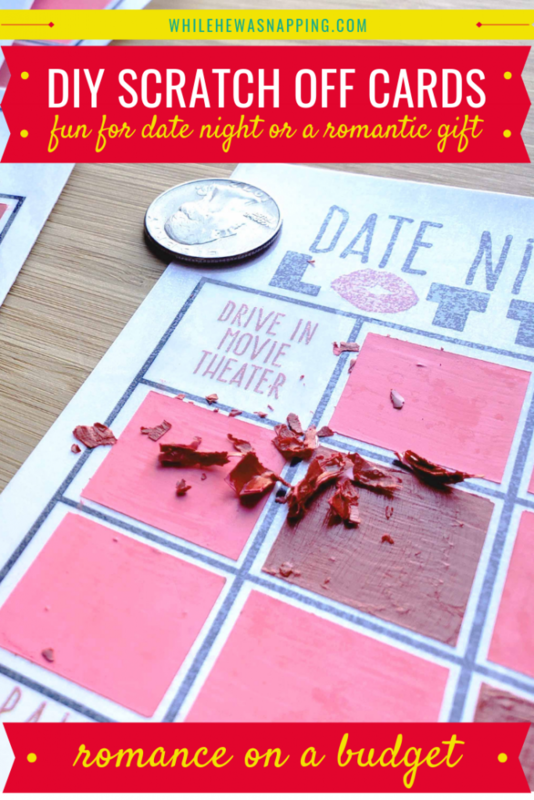 Scratch off a square and you have a great date idea without adding a ton of stress or prep to date nights! Or maybe you’re looking for a way to reconnect with your sweetie or to spice things up in the bedroom a bit? Then a set of Lover’s Lotto or Spicy Lover’s Lotto cards might fill your needs best. Scratch off one of those squares and forget your boring, old routine! Right at your finger tips is a great new romantic idea to fill your evening! And I’ll give you the blank templates in just a minute! Doesn’t get much easier than that! 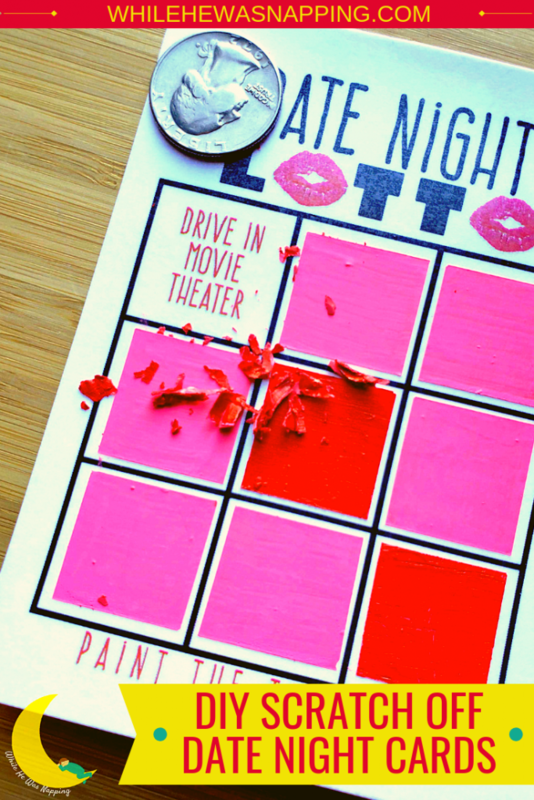 ARE DIY SCRATCH OFF CARDS YOUR KIND OF PROJECT? This project is pretty simple, but it’s not for everyone. So, how do you know if it’s the kind of thing you’re looking for? Who is this post written for? What demographics will benefit from this information? Make an emotional connection and hit a pain point. Do you enjoy a good, simple DIY project? Are you looking for a way to liven up your love life? Do you need a romantic gift idea that doesn’t cost a lot, doesn’t take a ton of time to put together and is something your gift receiver will love? Are you trying to stick to a budget? If you said yes to those – or any combination of those – then this project is exactly what you’re looking for. 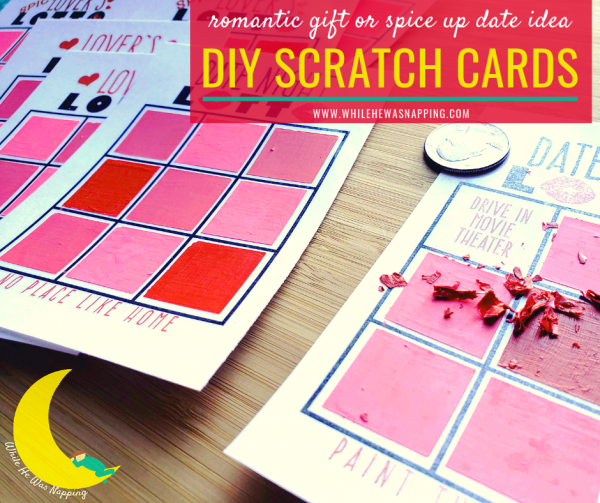 With just a few simple supplies and an afternoon, you’ll have custom DIY scratch off cards perfect for your needs. A quick print job, some trimming and laminating, and a splash of paint is all you need to get one step closer to a spicier love life. And don’t worry, most of the project time is waiting for the paint to dry. While it will take a few hours for your DIY scratch off cards to be all ready to go, you don’t need to carve out a whole afternoon to spend slaving away. Acrylic paint and paintbrush – any color will work, but a metallic paint will look most like a typical scratch off card. Follow your colorful heart, there is no wrong choice. Dish soap – the kind you hand wash dishes with, not the kind you put in the dishwasher. 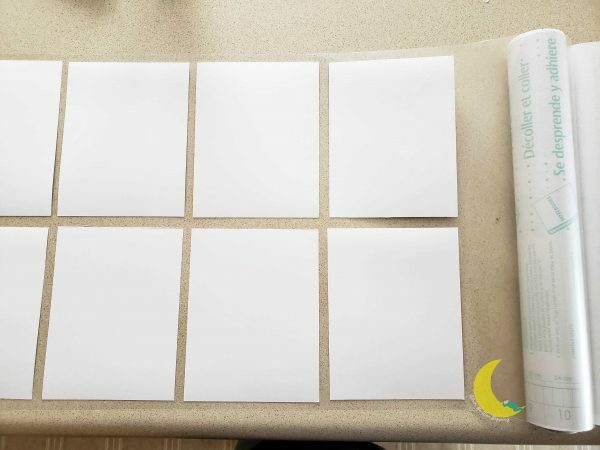 Step #1: Download and print your blank lotto card templates. I recommend printing with a laser printer and on card stock for durability. Ink jet and regular paper will work just fine though. *If you choose to grab my editable PDF files from my Etsy shop, you’ll want to fill those in before you print them. Step #2: Fill in the blank templates with a pen or marker. Leave some space around your writing to make sure it won’t stick out from under the paint when you cover them up. You don’t need to leave a lot of space, but try not to write all the way to the borders of the boxes. Step #3: Cover the front of your lotto card templates with the clear contact paper. You can cover the back too, if you want, but it’s not necessary. This cover will help protect the cards and is how the paint will scratch off your DIY scratch off cards. Step #4: After the contact paper is on the cards, cut the cards apart. The files are formatted to cut an 8.5″x11″ paper into quarters. You absolutely can cut the cards smaller though. I did trim mine smaller for neater edges and smaller margins. Step #5: If you choose, mask off the edges of the cards. 3mm washi tape is perfect for this! Just put a line of tape on all the grid lines on the card. It’ll keep your paint lines nicer. Repeat with each card. Step #6: Mix your acrylic paint and dish soap with an approximate 2:1 ratio – 2 parts paint, 1 part dish soap. It’s not rocket science and you don’t have to have precise measurements for this to work, so don’t stress over it. Step #7: Apply a thin layer of paint over the words on your card. Let the paint dry thoroughly. Step #8: Repeat step #7 until you can no longer see the text through the paint. Depending on what color paint you use, you may need 3-5 coats. Let dry overnight once you can no longer see text through the paint layers. That’s it, your ready to spice things up! ** A laser printer will keep your ink from smudging, should the cards get wet. Using laminating pouches will also accomplish this. An ink jet printer will work just fine, just be cautious not to get the cards wet if you don’t laminate them with pouches. ** Skinny 3mm washi tape is perfect for masking off your grid lines while you paint, however it is NOT a necessity. It will keep your paint lines neater, make painting easier, and make your cards look better overall, but free-handing the painting process is definitely an option and will save some time if you don’t have to mask off your grid lines. You could also cut down and use masking tape or scotch tape, if you prefer. ** Use fresh paint. By that, I mean not paint you’ve had in a cupboard for a few years… As you can see in that last photo, I started using silver paint. But it was old. It was clumpy and kept separating and didn’t mix well with the dish soap, so I ditched it for the red and pink paints. Newer, non-clumpy paint will give you a much better result with far fewer coats of paint. ** The painting and waiting to dry process is the longest part of this project, but it will turn out so much better if you do thin layers rather than a thick, globby one. You can use a blow dryer on low heat, low air flow to speed this process up. 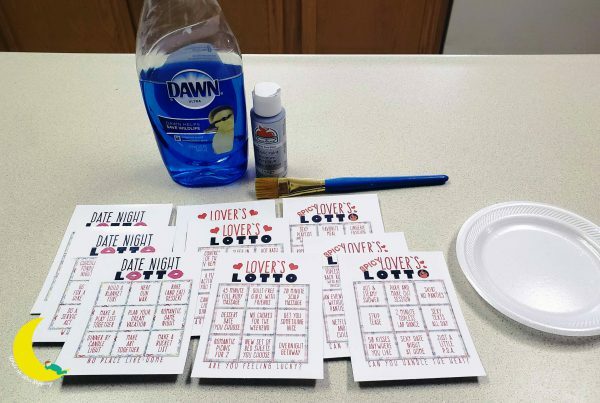 ** If all this masking off and painting thing is more than you want to deal with, you can use scratch off stickers to cover your date ideas instead. Take this cute idea and simplify! Find scratch off stickers on Etsy or on Amazon. Got more questions? You’re always welcome to leave a comment or shoot me a message! 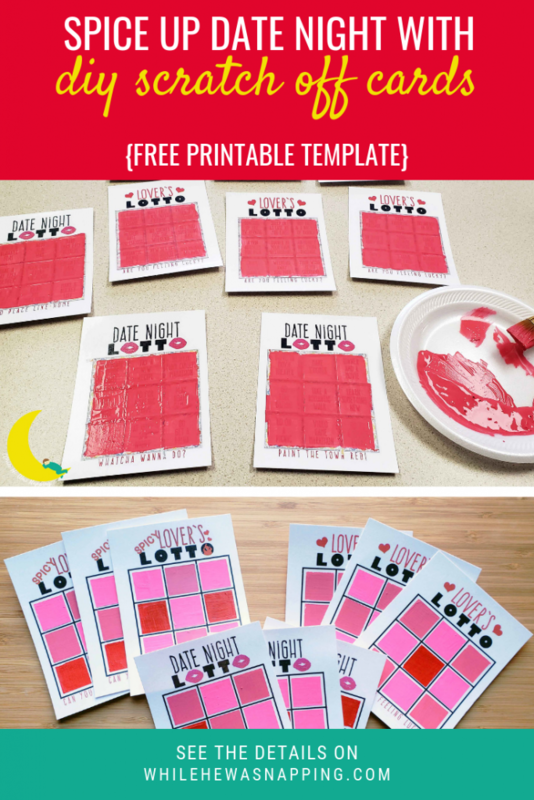 READY TO MAKE SOME DIY SCRATCH OFF CARDS AND SPICE UP YOUR LOVE LIFE? In just an afternoon you can spice up date night and add some fun and mystery to your romantic life. This project is simple and fun. It’s a great romantic gift idea that is customizable to fit your exact needs. And who wouldn’t love to get some DIY Scratch Off Cards like these?! Turn on some mood music, grab a coin and start scratching off those fun ideas! Thanks for joining my linky party. Ha ha these are way cute! Totally something I would do too! What a clever idea!! Love this! So many different usee. Would be cute for a child’s birthday etc. I am hosting a link party on my blog next weekend about words/quotes (The Weekend Word Search). Please consider stopping by! Your project would be a great addition. DIY scratch offs?! SO cool! Thanks for sharing! I didn’t know there was such a thing as scratch off you could DIY! Thanks for the nice comment on my anniversary quilt wallhanging! Hi! I’m your newest follower from the blog hop, hope you can stop by and visit my blog!